Over the years, I have met a wide variety of celebrities at the Global Traveler annual awards event. I always have a hard time naming who would be my favorite of all time. This year's celebrity guest of honor would be right in the discussion for my favorite. 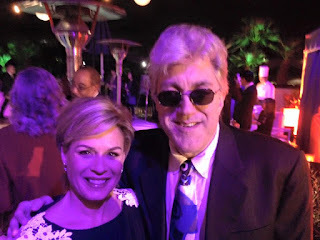 I admit I was pretty darn excited when I heard that Iron Chef Cat Cora would be appearing at the GT gala. I informed Fran Gallagher that I would definitely be hovering around until I scored a picture with her and Fran assured me he'd take care of it. Always a man of my word, I started hovering around her general area as soon as I saw Cora enter the party area. Always a man of his word, Fran introduced me to Cora and snapped a few pictures. Seriously though, Cora was an outstanding celebrity guest. She mingled with everyone and our paths crossed several times. I assured her I was not trying to smother her. The other guests loved her as much as I did. Cat Cora was a winner at GT, just like on Iron Chef. Score another great one for Fran and GT! Cat Cora and me in Beverly Hills, CA-December 2015.